It is always interesting to see the surprise of those who think the countryside ends at a straight line drawn across the map from London to Bristol, and who believe that anything north of that line consists of a world of narrow streets, terraced houses, wall to wall factories and industrial grime. Our friends from Gosport visited a few weeks ago. They have been in the navy all their lives and now they are retired, and live in a house situated on an isthmus, a marina on one side and the main harbour on the other. They can watch the daily ferries from their windows as well as the private yachts and motor launches. To reach Portsmouth it is quicker to take the ferry than to struggle through the continuous traffic. They could not believe we had so much open space, green fields and trees and that the air we breathed was fresher than the Gosport variety. They waxed lyrical and endlessly on "How green everything was" and " We didn't think it would be like this", and it made me view our environment with new eyes. It really was green and fresh and clean and this thought made me think of my childhood and where I grew up and played. As a result I visited my childhood home and revisited the fields where I had played. I walked along the old original footpaths which were short cuts from one road to another. Amazingly, most were still there, they had not been built upon, although, to some extent they were changed, but then not everything can stand still, nor, I suppose, should it. Number 117 Windsor Avenue. My first home was at 117 Windsor Avenue, Penn. 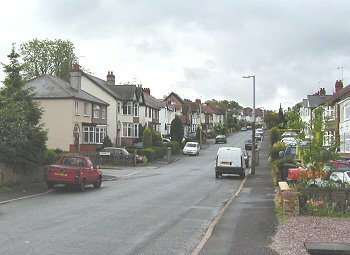 A road which starts from Coalway Road and climbs to Penn Road. About half way, there is a slight downwards slope, before it starts to climb again. At this point there is a concrete covered culvert at right angles to the road which leads to adjacent fields and the name of the road also changes to Pennhouse Avenue, a mystery which I could never understand. 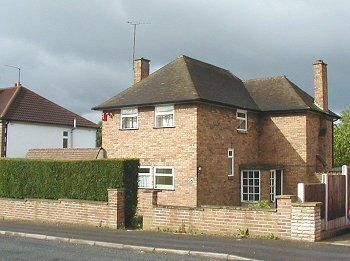 We lived on the right-hand side of the road in a typical semi-detached house of the period, when strip development was common. 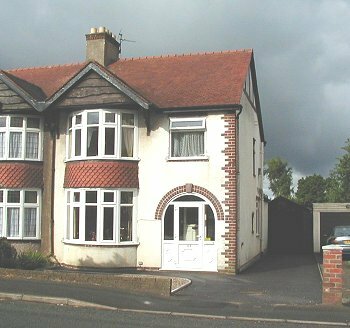 We had a lounge, dining room, kitchen with triplex oven and a scullery. The last two were separated by a coalhouse. An inside coalhouse; only a man could have come up with that idea. It was a never ending source of coal dust and drove my mother to distraction. Upstairs there were 3 bedrooms and a bathroom. Outside a drive and a garage, built by my father, which is still standing. The garden was long and narrow and went down to the fields at the back. We spent all our free time playing there. The fields were divided by hedges and grazed by cows which belonged to the local farmer. 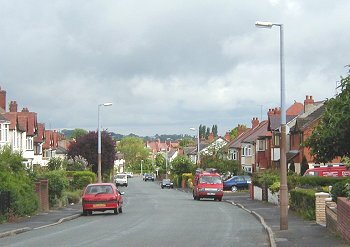 Looking up towards Pennhouse Avenue. Looking down Windsor Avenue towards Coalway Road. I realise now, having seen fields full of Friesian and Jersey cows, that they were a hybrid bunch, brown, white, black, with their horns still attached and I always gave them a wide berth. The cows belonged to Mr. Read and Mr. Mansell who lived just across the road. Mrs Mansell was the Read's sister. One entered the farmyard by walking along what is now the entrance to Kingswood Gardens. The cow sheds were on the left and the farmhouses faced them across the farmyard, and behind the houses were fields. 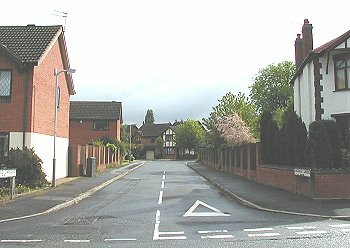 All gone now and replaced by modern houses. The right of way through the farmyard is still there and it is still possible to walk through Kingswood Gardens to the path at the back, which runs from Coalway Road to Osborne Road. The path was used as a short cut when going to school at Woodfield Avenue. 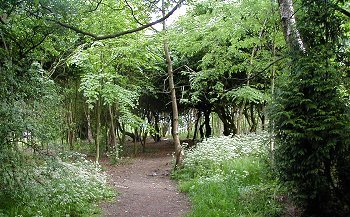 I walked along the footpath again, it seemed shorter and narrower than I remembered, but still there and being used by children and parents as a shortcut. Kingswood Gardens where the farm once stood. Number 107 Windsor Avenue. Each day Mr. Mansell would drive the cows from the farm, into Windsor Avenue, along the road turning right, through a wide entrance, now occupied by number 107, and into the fields where they spent their day grazing. In the evenings he would drive them back to the farm to be milked. The cows plodding along at their own pace, taking their time, and pushing their horns through the hedge in our front garden and munching at the dandelions as they passed. Turning patiently into the farmyard, each one went to its own stall to be milked by hand, patiently waiting their turn. Each day Mr. Mansell, his flat cap at a jaunty angle, would deliver the milk. He rode on a horse and cart, a type of open cart with milk churns at the back. The horse needed no instructions, he stopped and started at all the customer's houses and Mr. Mansell dispensed the milk from the churns. He would dip in the measure and bring it out of the milk, frothy and creamy, and pour it into the largest jug we had. Milk was rationed, but he always filled our jug and milk was one thing we were never without. A map of Windsor Avenue and the surrounding area. Deliveries were the norm. The baker, my mother called him fairy feet, because he walked so quietly, came daily, his van was filled with a wide choice of loaves. The fish man came once a week as did the man who delivered stone bottles of lemonade and dandelion & burdock. 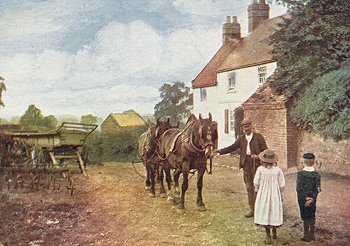 The coalman delivered using a horse and cart of course. The sweep came too, but on a bicycle, taking the sack of soot away with him. 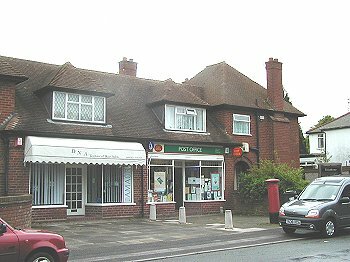 Windsor Avenue Post Office. At the bottom of the road there were a few shops, a grocer, butcher, greengrocer and post office. The postmaster was William Lawley, who became Mayor of Wolverhampton in the late 1940's. When the war started, my mother registered for our rations with the local shops, and errand boys would deliver the orders by bicycle. Adjacent to the greengrocer's there was an open piece of land which leads straight into the fields at the back, it is now the main entrance to Windsor Avenue playing fields. In the 1940's it was the site of an A.R.P. post, demolished after the war. 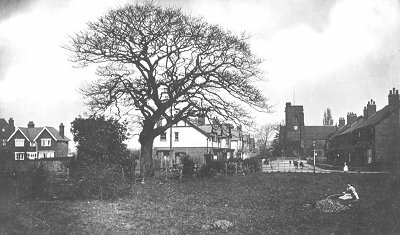 The allotments at the back of the house in Windsor Avenue are now no longer there and have been replaced by a copse of trees. Allotments are still there at the back of the houses in Coalway Road. My father, like everyone else, had an allotment and was urged "To dig for victory". One year he grew too many parsnips and sold them to the local greengrocer, who was delighted to get them. It is difficult to imagine in these days of plenty, that in the 40's and 50's that there was no choice, no endless varieties from which to choose. The site of the Windsor Avenue allotments. 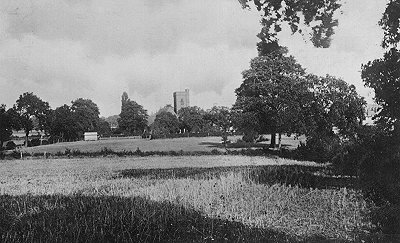 St. Philip's Church from the fields. From an old postcard. The hens stopped laying in the winter and eggs had to be laid down in isinglass. Peas and beans were not frozen but had to be podded or sliced. The fruit was bottled or made into jam, a special sugar allowance was given in the summer, and one made one's own pickle, or went without. It seemed as if everything was rationed, coal, clothes and even furniture. Revisiting my old home, I found that the road had not changed, it still rises towards Pennhouse Avenue, there is still the slight decline and the road name changes halfway. The fields at the back are still there as indeed is the brook in which I used to paddle and where the cattle used to drink. The hedges have gone and the fields are sports fields now. 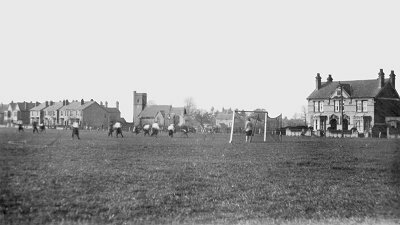 Coalway Road Playing Fields. From an old postcard. St. Philip's Church from the West. From an old postcard. There are more trees but no hedges, they have all been rooted out. The path from the fields up to the Penn Road is still there, as is the concrete covered culvert. However, I could not find its entrance, not that I would have crawled up it again, as I did as a child. It was a must for all children, we crawled inside the culvert until we reached the entrance under the road, Windsor Avenue, and out the other side into Osborne Road. I never ventured under the road, although others did and lived to tell the tale. The concrete covered culvert is now the only entrance to the fields at the far end of Windsor Avenue. The entrance which Mr. Mansell used to drive his cows into the fields is now occupied by number 107. During the war it was occupied by a static water tank and the pig bins where everyone put their waste food for the pigs. After the war the tank was demolished and number 107 was built. 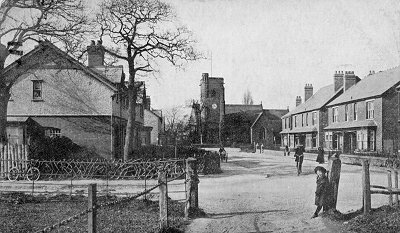 Church Road in about 1905. From an old postcard. This picture from an old postcard is actually a scene at Lower Penn, but it gives an idea of what it was like in Windsor Avenue. The farm and cow sheds have gone, but I can remember taking my dog's puppies there to have their tails docked. Mr. Mansell was the chief surgeon. Taking from his waistcoat pocket an old pen knife, he sharpened it on the edge of the wooden cow stall. Then laying each tail on the edge of the stall he quickly sliced it off, returning each puppy, tail-less, to their basket. I watched with interest, I was only 7. I soon returned them to their mother who nearly wore out her tongue licking the poor stumps better. So here is a mixture of reminiscences, some of which could never happen today in our over protective society, but joy of joy, my fields and brook and paths are still there. Even the pink campions are still blooming. The hedgerows have gone and Mr. Mansell and his churns of milk are only a memory. Never the less we are still green north of London. We still have space and the trees still blossom and we have paths and open spaces and babbling brooks to enjoy. Perhaps we should guard our secret well or those who believe we are totally built-up may invade our open spaces.